Woburn was first settled in 1640 near Horn Pond, a primary source of the Mystic River, and was officially incorporated in 1642. At that time the area included present day towns of Woburn, Winchester, Burlington, and parts of Stoneham and Wilmington. In 1730 Wilmington separated from Woburn. In 1799 Burlington separated from Woburn; in 1850 Winchester did so, too. "America's oldest active gun club," the Massachusetts Rifle Association, was founded in 1875 and moved to Woburn in 1876. Rail depot closed in 1962. Woburn Police Officer John B. Maguire was killed in the line of duty while responding to an armed robbery on December 26, 2010. Woburn was the scene of a high-profile water contamination crisis. During the mid to late 1970s, the local community became concerned over the high incidence of childhood leukemia and other illnesses, particularly in the Pine Street area of east Woburn. After high levels of chemical contamination were found in City of Woburn’s Wells G and H in 1979, some members of the community suspected that the unusually high incidence of leukemia, cancer, and a wide variety of other health problems were linked to the possible exposure to volatile organic chemicals in the groundwater pumped from wells G and H.
In May 1982, a number of citizens whose children had developed or died from leukemia filed a civil lawsuit against two corporations, W. R. Grace and Company and Beatrice Foods. Grace's subsidiary, Cryovac, and Beatrice were suspected of contaminating the groundwater by improperly disposing of trichloroethylene (TCE), perchloroethylene (perc or PCE) and other industrial solvents at their facilities in Woburn near wells G and H.
In a controversial decision over what many considered a bungled trial (Judge Walter Jay Skinner ruled that the jurors should answer questions that they and many others considered confusing), Beatrice was acquitted and Grace only paid $8 million, a third of which went to the lawyers and lawyer fees. A United States Environmental Protection Agency report later found Beatrice and Grace responsible for the contamination. A book titled A Civil Action was written about the case by Jonathan Harr. In 1998 the book was turned into a movie starring John Travolta and Robert Duvall, also titled A Civil Action. The film was largely filmed in nearby Bedford and Lexington, with only a few shots on location in Woburn. Woburn is located at (42.484545, -71.152060). 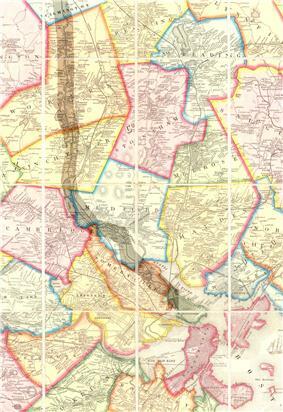 It is bordered by the towns of Wilmington, Reading, Stoneham, Winchester, Lexington, and Burlington. According to the United States Census Bureau, the city has a total area of 12.9 square miles (33 km2), of which 12.7 square miles (33 km2) is land and 0.2 square miles (0.52 km2) (1.71%) is water. Woburn features a humid continental climate, similar to those of many of the other Boston suburban areas. It features moderately cold Winters, but not usually as bad as the ones around The Great Lakes Regions or Southern Canada, or even Northern New England. Nonetheless, it features occasional 'arctic blasts' which can easily drop the temperature below zero. Spring generally starts out cool, around 45-50 degrees, often with snow still on the ground. However, it quickly begins to rapidly warm to around 75 degrees by the time Summer begins. Summers are generally warm or hot & often accompanied with humidity, though not nearly as bad as cities in The Midwest & Mid-Atlantic, and even Rhode Island. Temperatures often top in the 80s, but when an Atlantic low comes, temperatures may fail to rise out of the 60s. High pressure from The Gulf of Mexico, occasionally brings much hotter conditions with temperatures sometimes topping near 100, though this is fairly rare and only happens so often. Falls are generally crisp, but start out warm with temperature highs around 70 & lows around 50. Quickly things cool, and it feels & looks like Winter with temperatures around 40 usually towards the end. Like most of the region, the temperature changes very frequently, so if you visit, then plan to bring a mix of both warm & cold clothes to the region. In the city the population was spread out with 21.1% under the age of 18, 6.9% from 18 to 24, 34.9% from 25 to 44, 21.8% from 45 to 64, and 15.4% who were 65 years of age or older. The median age was 38 years. For every 100 females there were 95.6 males. For every 100 females age 18 and over, there were 93.1 males. The median income for a household in the city was $54,897, and the median income for a family was $66,364. Males had a median income of $45,210 versus $33,239 for females. The per capita income for the city was $26,207. About 4.5% of families and 6.1% of the population were below the poverty line, including 7.9% of those under age 18 and 5.4% of those age 65 or over. The Woburn Business Association (WBA) is a membership organization consisting of companies located in Woburn, Massachusetts. Memberships are also available to those firms who are situated elsewhere, but do business in Woburn. The purpose of the WBA is to promote and protect Business Interests in the City of Woburn and provide Networking Services for the Business Community. The WBA Board of Directors meets monthly to develop policy and provide direction for the Association. The Executive Committee meets periodically, usually on an “as needed” basis, to review important issues and make recommendations to the Board regarding WBA policy. Th WBA accomplishes its work through committees of WBA members and representatives of the Woburn community. The membership is encouraged to actively participate on these committees. 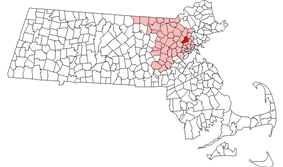 The Woburn Redevelopment Authority is an independent municipal urban renewal authority established by the City of Woburn in 1961, in accordance with Massachusetts General Laws Chapter 121B. The Authority is governed by five members, four of whom are appointed by the Mayor, and one by the Governor. The WRA functions as the City's community development agency, under an agreement with the City of Woburn executed in July 2000. Companies based in Woburn include Boston Acoustics, Monotype, and Skyworks Solutions. Woburn's public elementary schools are the Goodyear Elementary, Altavesta Elementary, Daniel P. Hurld Elementary, Shamrock Elementary, Malcolm White Elementary, Clyde Reeves Elementary, Linscott Elementary, and Wyman Elementary. (The Parker, Tarkey, Plympton, Golden, and Veterans' Memorial Schools are now closed, and the former Veterans' Memorial School now serves as the Woburn Senior Center.) The two middle schools are the John F. Kennedy Middle School and Joyce Middle School. In recent years Reeves, Shamrock, and Malcolm White, as well as Woburn Memorial High School, have been rebuilt. (Rebuilding of Goodyear Elementary is finished.) The new Woburn Memorial High School building now has automated teller machines, automatic light switches, and classrooms with projectors. St. Charles, a pre-K-to-8 private Catholic school, is part of the adjacent St. Charles Parish. 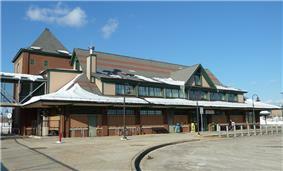 Mishawum is a stop on the MBTA Commuter Rail's Lowell Line that currently has only limited reverse rush hour service. MBTA Bus routes also run through Woburn along its main roads, such as Main Street, Montvale Ave., Lexington Street and Cambridge Road. The routes run north to Burlington and Wilmington and south to Boston. Samuel Warren Abbott, an American physician. Col. Loammi Baldwin, Revolutionary War engineer, builder of the Middlesex Canal. Eric Bogosian, actor, playwright and novelist. John Carter, former Boston Bruins player. Edward Johnson, "Father of Woburn"
David Robinson, American rock drummer. ^ Richardson, Doug. The English Origin and Ancestry of The Parker Brothers of Massachusetts and their Probable Aunt, Sarah Parker, Wife of Edward Converse. NEHGS Register, Vol. 153. January 1999, No. 609. See http://freepages.genealogy.rootsweb.com/~converse/sources/nehgs.html Accessed 20 May 2007. ^ Thompson, Rev. Leander, "Deacon Edward Convers," Winchester Record, October, 1885 (http://freepages.genealogy.rootsweb.ancestry.com/~converse/bios/edw-bio.html Retrieved 10 Feb. 2011. ^ Long, Tom (11 May 2005). "Judge Walter Skinner, 77; oversaw Woburn-Grace case". The Boston Globe.